Although the Pseudomonas aeruginosa infection is well known and frequently found in hospitals and nursing care facilities, many cases are also reported outside these boundaries. In general, this pathogen infects debilitated patients either by comorbidities or by any form of immunodeficiency. In cases of respiratory infection, tobacco abuse seems to play an important role as a risk factor. In previously healthy patients, community-acquired pneumonia (CAP) with P. aeruginosa as the etiological agent is extremely rare, and unlike the cases involving immunocompromised or hospitalized patients, the outcome is severe, and is fatal in up to 61.1% of cases. Aerosolized contaminated water or solutions are closely linked to the development of respiratory tract infection. In this setting, metalworking fluids used in factories may be implicated in CAP involving previously healthy people. 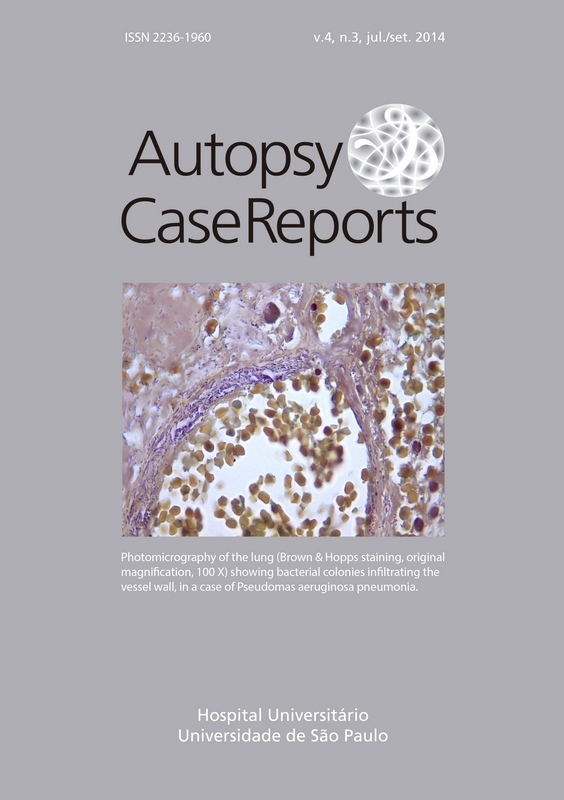 The authors report the case of a middle-aged man who worked in a metalworking factory and presented a right upper lobar pneumonia with a rapid fatal outcome. P. aeruginosa was cultured from blood and tracheal aspirates. The autopsy findings confirmed a hemorrhagic necrotizing pneumonia with bacteria-invading vasculitis and thrombosis. A culture of the metalworking fluid of the factory was also positive for P. aeruginosa. The pulsed-field gel electrophoresis showed that both strains (blood culture and metalworking fluid) were genetically indistinguishable. The authors highlight the occupational risk for the development of this P. aeruginosa-infection in healthy people.